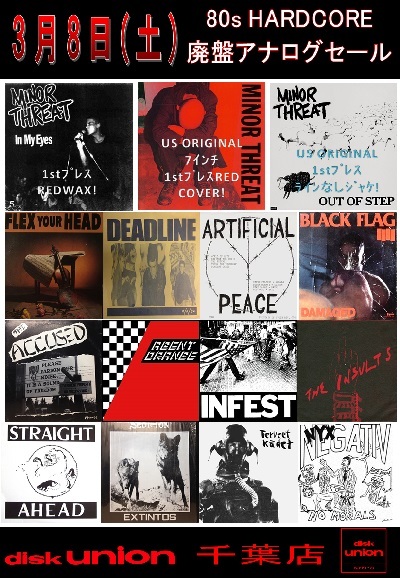 ● MINOR THREAT / IN MY EYES DISCHORD5 盤質： B EX-/1st PRESS RED WAX/INSERT sold! ● FINAL CONFLICT / IN THE FAMILY REFG 盤質： A 7ｲﾝﾁ ｼﾝｸﾞﾙ NM/NM/ W/INSERT/ US REFLEX ORIGINAL ! ● BLACK FLAG / KEEP IT IN THE FAMI SST12001 盤質： B 12ｲﾝﾁ ｼﾝｸﾞﾙ VGｼﾞｬｹ傷み/VG++/RARE UK ONLY 12"